Key difference: The alphabets a, e, i, o, and u are called as vowels in the English language. Consonants are all the other alphabets of the English language, except the vowels. At times, the alphabet 'y' is also considered as a vowel. Merriam-Webster defines a vowel as “a speech sound made with your mouth open and your tongue in the middle of your mouth not touching your teeth, lips, etc.” The letters representing the vowels are a, e, i, o and u. Vowels, along with consonants, are an intrinsic part of English elementary education. They are the very basics of phonetics, through which one learns to voice out words in the proper manner. Learning vowels is absolutely crucial to a person’s grammatical and vocabulary skills as well. While using vowels in writing a piece of text, one must take into consideration an important rule associated with doing so. The rule, as per English grammar syntax, requires that any alphabet which is a vowel should always be preceded by the word ‘an’, instead of the word 'a'. In this sentence, the word ‘apple’ starts with the letter ‘a’. So, the word ‘an’ is placed to satisfy the grammatical rule associated with vowels. Consonants are the speech sounds which are made by either totally stopping the flow of air exhaled out from the mouth, or by partially stopping it. Consonants are voiced out completely in contrast to vowels, which are the speech sounds produced by the free flow of air exhaled from the mouth. Along with vowels, consonants are crucial to a person’s understanding of the phonetics concerned with different words. They help an English language aspirant to know and implement the correct way of speaking the language. 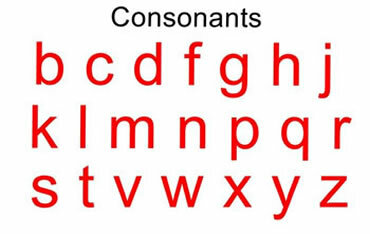 Consonants are represented by all the English language alphabets, other than the five vowels. Unlike vowels, consonants are not tagged along with any rules of grammar. They can be preceded by words like it, they, the, for, etc. An important point to note about the vowels and consonants is the letter 'y'. The alphabet 'y' is considered both a vowel and a consonant by many people. In fact, in the United States, children are taught that the vowels consist of the alphabets a, e, i, o, u and y. The rationale behind this is the speech sound produced while voicing out this alphabet in different words. For instance, in a word like 'Yesterday', the embedded sound voiced out is more like saying 'Jesterday'. In other words, the letter 'y' is spoken out as the letter 'j', which is a consonant. However, there are also words in which the letter 'y' is voiced out like a vowel. For instance, "Style', where the pronunciation appears to be more like "Stile'. The letter 'y' functions as the vowel 'i' in this word. Thus, taking its dual capacity into consideration, the letter 'y' is considered as a vowel and also as a consonant in many countries, and by many people all over the world. 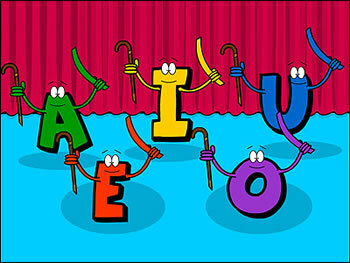 The alphabets a, e, i, o, and u are called as vowels in the English language. At times, the alphabet 'y' is also considered as a vowel. Consonants are all the other alphabets of the English language, except the vowels. They are the speech sounds made with the mouth open and tongue in the middle, while ensuring that it doesn’t touch the teeth, lips, etc. They are the speech sounds made by either totally stopping the flow of air exhaled out from the mouth, or by partially stopping it. There are five vowels in all. There are 21 consonants in the English language. Vowels always have to be preceded by the word ‘an’, instead of 'a', 'the', 'they', etc. Consonants have no such rule. There is an owl on that tree.